Over the years, Toshiba America Information Systems' ability to release cutting-edge products before users expect them has won the company a leading share of the notebook PC market. With the release of its new, scalable 7350 Equium PC series, Toshiba is attempting to do the same thing in the desktop PC market. Toshiba starts with a unique design for its Equium PC line. All Equium PCs, including the 7350 series, include common components and one basic design configuration across all three chassis styles'slim, full-size and minitower. This approach results in reduced spare-parts inventories and technician training time, which can translate into a relatively low total cost of ownership. The Equium 7350 is even more scalable and potentially more cost-effective than its predecessors. Entry-level configurations featuring Intel Celeron processors with limited memory can cost less than $750, while high-performance systems with 733-MHz Pentium III processors start at around $1,500. The 7350 models also incorporate the Intel 810E chip set with integrated graphics and a 133-MHz front-side bus. You can choose an operating system from among Microsoft Windows 98, Windows NT Workstation and Windows 2000, and build in more than the basic 128M of synchronous dynamic RAM memory if you need it. 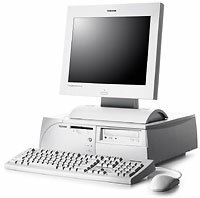 The Equium 7350D from Toshiba America Information Systems comes with a 733-MHz Pentium III, 128M RAM and a 15-inch flat-panel LCD monitor. Management software includes Intel's LANDesk Client Manager, Desktop Management Interface 2.0, Advanced Configuration and Power Interface, and Wake-on-LAN. Toshiba's Configuration Builder CD for creating custom software across a network is bundled with every 7350, and Toshiba's power-saving feature, SecureSleep with Instant-On, is built into every unit as well. Because a 7350D model with a 15-inch TekBright 60A flat-panel monitor wasn't available in time for review, I opted to test a 7100M model. It came without a monitor but with 128M of RAM, a 17M hard drive, a 40X CD-ROM drive, NT Workstation and a bundled Zip drive. I'm glad I chose the 7100M. Although its 600-MHz Pentium III processor isn't as speedy as the 7350's 733-MHz CPU, it proved to be plenty fast at running all the Microsoft Office 2000 applications I loaded. The 7350's Intel 810E chip set is an improvement over the Intel 82440BX chip set in my unit, but my system's overall performance was excellent. Because the 7100M, with a full-sized tower, was designed with corporate requirements in mind, it did not come with a 56-Kbps V.90 modem. But I popped in my own in seconds. The PC did come with a built-in 10/100-Mbps Ethernet card and plenty of expansion bays. As for the standard video card with 4M of memory, I recommend that power users exchange it for one with at least 8M. The feature I liked best about the 7100M was its Instant Access Door. To easily get at the system's motherboard, cards and other components, you just slide a release button atop the case, and the top panel and part of the side panel can be instantly removed. Just about everything inside the case can be removed or changed out, without tools and in seconds. There's even a diagram inside the case that shows users exactly where each component is. Even a nonexpert can swap out a motherboard, add RAM or even switch out a hard drive with little effort. All the features on the 7100M'and more'are available on the Equium 7350 models. At $2,561 on the General Services Administration's Information Technology Schedule, some 733-MHz Pentium III Equium 7350s with TekBright 60A monitors could soon be turning heads in a few lucky government offices.